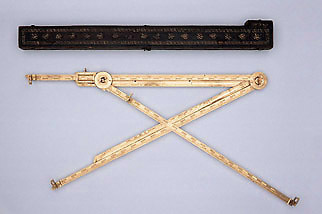 In this instrument the principle of triangulation often applied to range-finding in gunnery has been adopted as the starting point for the design of an elaborate and richly finished instrument, that hardly seems appropriate to the battlefield. It may be that this example was destined instead to attract or reward patronage, or to create a good impression at court. The context of battle is enforced by the provision of scales to calculate the weight of iron, lead and stone shot of different sizes. The survival of the original leather-tooled case is very unusual and, together with the well-preserved condition of the instrument, supports the idea that it has not seen active service.